Maternity Services at the Midland Regional Hospital Portlaoise and Trinity College Dublin today, Monday 22nd October, are delighted to announce the signing of a memorandum of understanding which will recognise Portlaoise Hospitalas an affiliated clinical teaching centre for students of the Trinity College School of Nursing & Midwifery. The Memorandum of Understanding was signed in the Board Room of the Midland Regional Hospital Portlaoise by the General Manager of Portlaoise Hospital Michael Knowles, Director of Midwifery Maureen Revilles with Trinity represented by the Head of Nursing and Midwifery Professor Anne Marie Brady and signed by Chris Morash Vice Provost. Professor Anne Marie Brady,Trinity College Dublin said, “The Faculty and the School of Nursing and Midwifery are pleased to fomalise our academic links the maternity services at the Midland Regional Hospital Portlaoise who share our determination to enhance the provision of care, improve clinical education and increase our capacity for research. 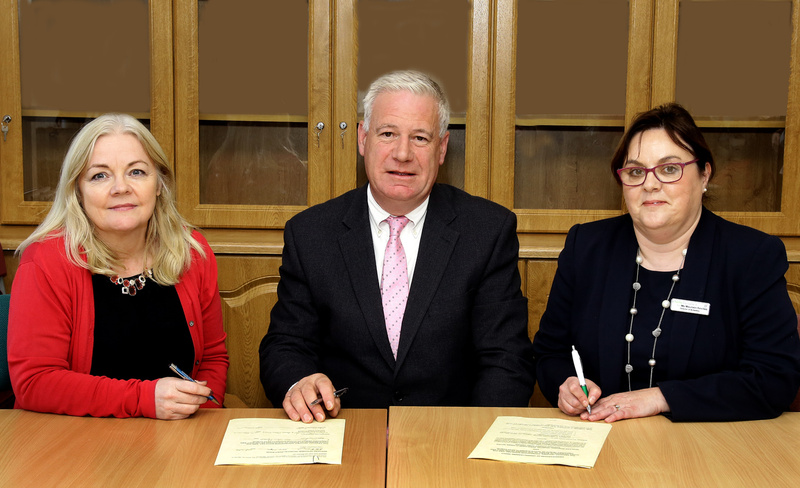 We are delighted to sign thisagreement with the MidlandRegional Hospital Portlaoise to advance the clinical training of our midwifery students. Welcoming the announcement,Mr Trevor O’Callaghan, CEO of the Dublin Midlands Hospital Group said, “The Dublin Midlands Hospital Group, through its academic partner, Trinity College Dublin are committed to fostering education, research and innovation for the benefit of patients and the continuous professional development of our health professionals. The provision of excellence in women and infants’ care is a priority as set out in our first Group Strategy 2018-2023 launched earlier this year. This provides us with an opportunity to enhance recruitment and retention of our midwiferynursing staff and theopportunity to actively participate in research and development of midwifery practice in conjunction with TCD.We are committed to working to realise the full potential to this MOU and begin this exciting new chapter for Portlaoise Maternity Services”, he continued. Maureen Revilles Director of Midwifery at the Midland Regional Hospital Portlaoise said, “The Maternity Services at Portlaoise Hospital are so pleased to formalise our academic partnership with TCD. This is an important development for the maternity department to become involved in the training of undergraduate midwifery students. This will help to raise the profile of the department as a progressive and vibrant service contributing to maternity care in Ireland. In the coming months we will be preparing for our NMBI site visit and approval and we will be appointing a Clinical Placement co-ordinator to support student midwives. Michael Knowles, General Manager Portlaoise Hospital said, “This is a strong endorsement of the maternity services at MRHP which will enable us to strategically position MRHP Maternity Services as an employer of choice for undergraduate and post graduate students. 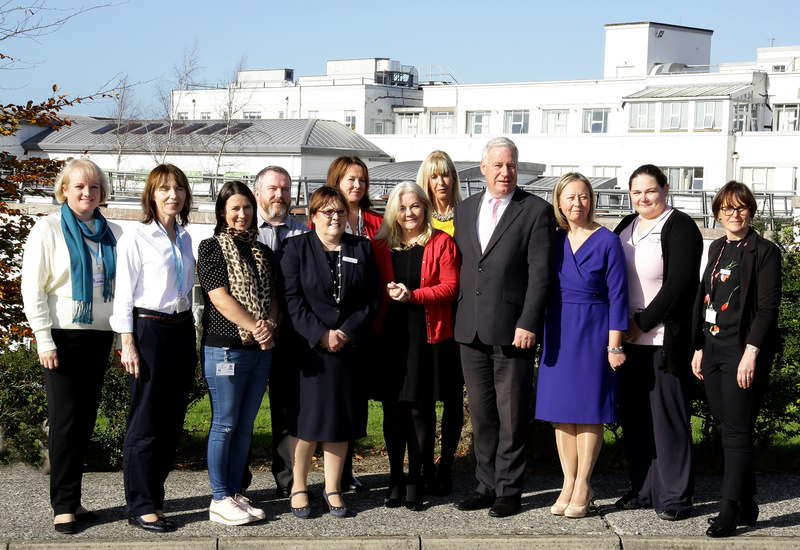 The Hospital Management with the support of the Dublin Midlands Hospital Group will continue to build on the developments that have taken place at the hospital in the last number of years, ensuring at all times the continuous delivery of excellence in women and infants care.